Bank of England Governor Mark Carney has said the institution has drawn up currency contingency plans, whatever the outcome of the Scottish referendum. This is the first time he has explicitly confirmed the bank is making plans for different outcomes that could impact financial stablity. 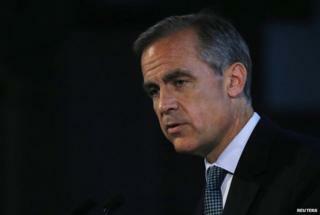 Mr Carney's comments came ahead of the 18 September independence referendum. Scottish and UK ministers are in dispute over plans for Scotland to keep the pound under a currency union. The Scottish government set out the scenario in the event of a "Yes" vote, but the leaders of the main UK parties have said they would not support a deal to share Sterling on a formal basis. In a speech given in January in Edinburgh, Mr Carney outlined the criteria for a currency union. He described his own speech as a "technocratic assessment of what makes an effective currency union between independent nations", rather than an assessment of Scotland's future economic options. During a news conference in London on Wednesday, Mr Carney stressed the decision about whether or not an independent Scotland would form a currency union with the rest of the UK would be made by politicians. In a carefully neutral comment, Mr Carney said it was the role of the Bank of England to implement whatever decision was made, and to ensure the financial stability of the whole of the UK. Sources in the financial world have told me that the plans are likely to focus on two issues - currency uncertainty and what is known as "deposit flight". I asked the Governor directly about both, and specifically fears raised in a recent report by UBS that in the event of a yes vote on independence, customers of financial institutions based north of the border may decide to move their money southwards. Some leading executives in the financial world are so concerned they had been hoping for a message of reassurance from the Bank. Mr Carney suggested he was across the issue, which I have been told by senior banking figures is of concern to at least four major financial institutions which are based in Scotland. To that end, he said that, as people would expect, the Bank had contingency plans for various possibilities. "It's never good to talk about contingency plans in public other than to assure that we have contingency plans," he said, adding: "In terms of our responsibilities for financial stability - we have a wide range of tools and plans." A key part of the role of governor is to provide reassurance both for the UK financial system and for markets. Mr Carney's latest comments were framed in that context. If Scotland does vote for independence, it would still be the role of the Bank of England to ensure financial stability for the whole of the UK - including Scotland - until an official date for Scottish independence is reached. The governor therefore repeated assurances that the institution would continue to act to ensure financial responsibility for the whole of the UK, whatever the outcome of the vote. He said: "I will reiterate that we will implement whatever we're asked to implement and I'll add further, if I may, that we also have responsibilities, as you know, for financial stability in the United Kingdom and we will continue to discharge those responsibilities until they change. "We will continue to discharge those responsibilities regardless of the outcome of the vote on the 18th September." Mr Carney's comments strike a different tone to the UK government, which has repeatedly said it was not putting contingency plans in place for the possibility of Scotland voting for independence. His remarks were welcomed by Scotland's first minister Alex Salmond who described them as "very helpful". In an interview on the BBC's Reporting Scotland, he said: "It shows that he is seeking to ensure financial stablity and that the Bank of England remains in the charge for that transition period. What a contrast with the views of the Westminster parties. "Secondly he has corrected once again the idea that he was against a currency union. He's said yet again he'll implement whatever is agreed." The first minister was asked about a BBC report that four major financial institutions in Scotland are worried that a "Yes" vote could result in customers moving their investments south of the border. Mr Salmond responded: "The fear of deposit flight is caused by a denomination risk. That is to say, you would use a currency other than sterling. "What we've been saying is exactly to prevent a fear of deposit flight, helped now by the governor of the Bank of England who makes it clear they would be in charge of financial stability." But Alistair Darling, the head of the Better Together campaign, said Mr Carney had undermined Mr Salmond's arguments. Mr Darling added: "The governor has confirmed that a currency union would not work without shared taxation and spending, the very things that Alex Salmond wants to dismantle with a Yes vote. "Mark Carney also confirmed that he will implement the decisions of the UK parties who have ruled out a currency union. "The money we would use if we vote for independence isn't an academic matter, it is critical to everyone in Scotland. Alex Salmond has got to come clean and tell us what Plan B is." The journalist was shot as she was observing rioting in Londonderry on Thursday night. Are you ready for another royal baby? Avicii: Is mental health in music still at risk?